Conserve Switch™ is rated 3.5 out of 5 by 12. Now you can control power to your whole computer system with a single click. The Conserve Switch Surge Protector with Remote lets you shut off power—including standby power—to all of your components with one touch of the wireless remote switch. The wireless remote controls six Remote-Switched outlets for all your peripherals—your monitor, printer, external hard drives, speakers and more. Two Always-On outlets stay on for devices that need continuous power, like your wireless router or cordless phone. Place the remote on your desk or shelf, or mount it on the wall, for the convenient way to save energy. Remote Control Size 4"" X 1.25"" X 12.875"""
Rated 3 out of 5 by CraigWorld from Great Idea! But? So, I have had this conserve switch for around 7-8 months... the principal of the unit is an awesome idea but lacks in the switch design department. Even before purchasing from Amazon, I read about issues with the switch itself. I decided to give it a change anyways as I don't always listen to reviews and I have been quite happy with other Belkin products. I have my switch connected to five monitors so I can turn them all off or on with a single click. Like others (user reviews), worked great for a while (one month) then I had a few issues. Again nothing that I was too concerned about. I found one day the switch would not turn on the monitors, turns out the battery was dead, I found that when I replaced the battery... the switch sometimes gets stuck on and kills the battery. So I bought a bunch of cheap batteries and paid special attention that the light wasn't on after I switched the switch on or off. It has been getting worse for the last few weeks... I find that if I take the battery out and back in, this sometimes helps... I have even removed the back checked the springs which mostly helps if the battery trick doesn't work. I believe the switch isn't a great design, the switch is kind of clunky when you toggle it... not smooth as you would expect. I actually came to the Belkin site hoping that they had released a newer model to which may have address what I call design flaws. I do like the concept of the conserve switch...just wished it worked a little better, would have spent a little more cash for a better designed model that was more reliable. Rated 3 out of 5 by eddi123 from Was great as long it owrked. The function itself is great. The remote let´s me switch on / off the power for 6 sockets from the top of my desk. But now after some use it does not really switch on. The LED "Remote Switched Sockets" will light up, but no power will be switched on. I have to smack it on the ground or give it a hard shake to get it working again. I am fron Germany. Rated 4 out of 5 by Roman from Great when it works I own two of these. one works flawlessly the other worked fine in the begining and now the remote will only turn on the power bar. However it will not turn off the powerbar. Very frustrating. Changed signal codes so no interference from the other unit and reset the powerbar but still doesnt work. Great idea, just wished it worked. Rated 5 out of 5 by Kurt Y from Belkin Conserve Switch remote control power strip I recently purchased the Belkin Conserve switch, along with the Conserve Insight energy monitor as a bundled set, (much better value than purchased separately) and both worked flawlessly, (see my other review on that item) The Conserve Switch not only allows you to maintain constant power to items like a router/modem and DVR, while switching off other devices that draw background power like smart TV's and unneeded power transformers separately, it is a surge protector as well, the power strip is well laid out regarding outlet positioning, and has two conveniently located and easy to use wire/cable holders, to keep your wires neatly bundled together and out of the way. 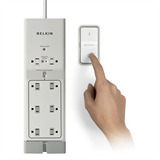 The Best part is that it comes with a Wireless Remote switch, (that cuts power to six of the eight outlets) and it can be wall mounted with screws or peel and stick tape,(already applied to the wall mount bracket) to place the bracket near an exit door like a normal light switch and for added convenience you can easily remove the remote from the mount and use it at the couch or coffee table ! Overall this is a Very well thought out and designed product, I've already recommended these to family members and friends, and would recommend these to anyone wanting to monitor and save electricity costs! Rated 3 out of 5 by jomfeal from works great when it works! 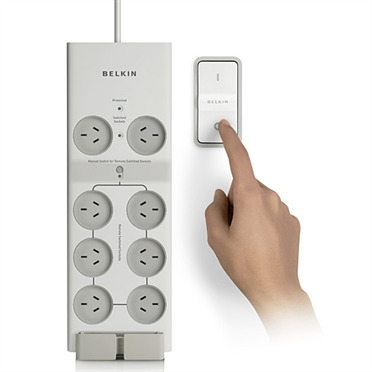 I have been using it for more than two years, now it works great to switch the outlets ON...but to turn them off...I HAVE TO STAND UP GET THE REMOTE TO AN INCH OR LESS FROM THE STRIP ...to Turn it Off! I already change the battery but the problem remains!